There are some things in life that are just a perfect combination, like pasta and cheese. 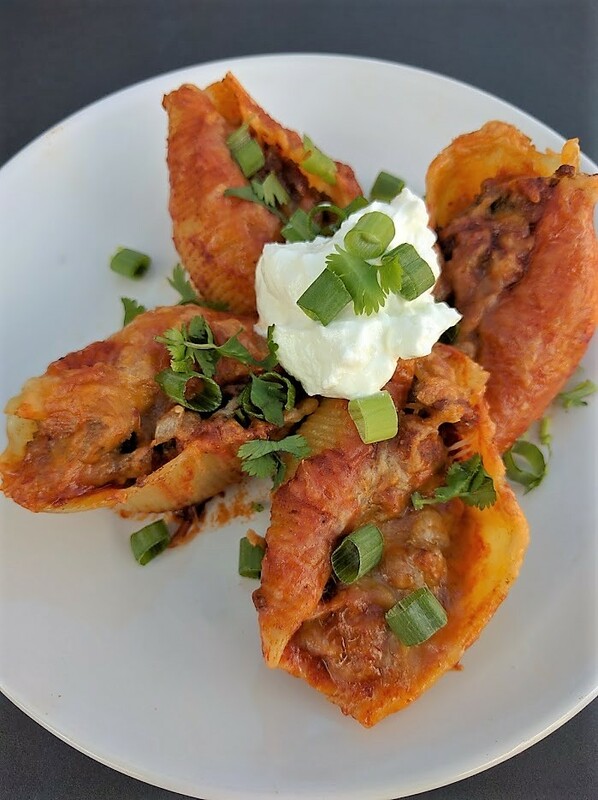 Take that combination and give it a Mexican flair, and you have Taco Stuffed Shells. Here’s a dish your family is going to love, I promise. We had this for dinner for the first time and everyone had seconds, well except for the baby, she was too interested in eating yogurt. This is what they look like right out of the oven, It’s like an Italian Enchilada! The filling is nice and creamy from the addition of cream cheese and the outside has a nice cheesy crust from the shredded cheese. I used ground beef, but I’m sure these would taste delicious with ground turkey, or even shredded Chicken. I know we’re all looking forward to leftovers tonight! For the pasta I used 1 box of Jumbo Pasta Shells and cooked per the package. While the water is boiling, saute some onion and garlic in a pan for a few minutes then add the ground beef, cook thoroughly. I used a homemade taco seasoning made up of Chili Powder, Cumin, Paprika, and Oregano. Then add some salt and pepper to taste. Otherwise 1 packet of Taco Seasoning works also. Once the beef is cook add 4 oz of Cream Cheese cut up into small chunks. Let the cream cheese melt into the meat, take the pan off the stove and let the mixture cool. After the pasta is done cooking, drain and rinse with cold water to stop the cooking and place the shells individually onto a baking sheet so they don’t stick together. Next get a large baking dish, 9 x 13 works, and spray with cooking spray. Then add a thin layer of the enchilada sauce to the bottom of the pan and spread it around. Use a spoon and place about a tablespoon of the meat mixture into each pasta shell and place open side up onto the baking dish. I ended up with a few shells leftover. Use the remaining enchilada sauce and cover all the shells, then sprinkle with shredded Mexican blend cheese. Bake in a 350 degree oven for about 20-25 minutes. Top with some sour cream, or Greek yogurt, green onion and cilantro. Sour Cream or Greek Yogurt, Green Onion, and Cilantro. Bring a large pot of water to boil and cook Pasta shells according to package. Heat a large nonstick pan with oil and saute onion and garlic for a few minutes then add the ground beef, cook thoroughly. Add 1 packet of Taco Seasoning or homemade seasoning. Once the beef is cook add 4 oz of Cream Cheese cut up into small chunks. Let the cheese melt with the meat, take the pan off the stove and let the mixture cool. After the pasta is done cooking, drain and rinse with cold water to stop the cooking and place the shells individually onto a baking sheet. Get a large baking dish, 9 x 13 works, and spray with cooking spray. Then add a thin layer of the enchilada sauce to the bottom of the pan and spread it around. 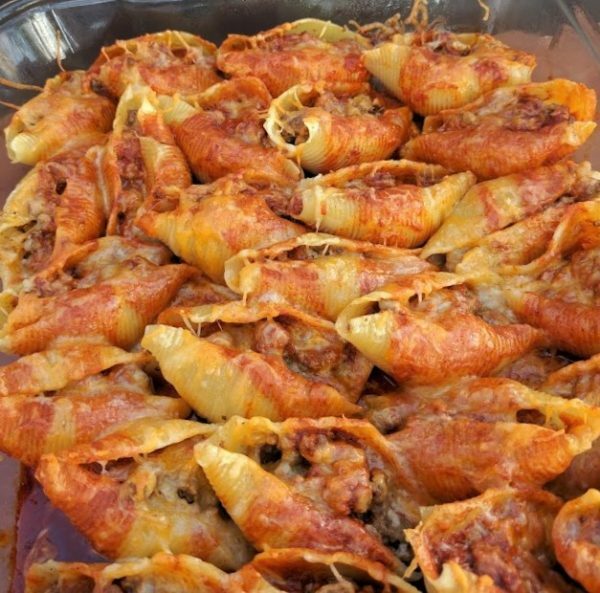 Use a spoon and place about a tablespoon of the meat mixture into each pasta shell and place open side up onto the baking dish. I ended up with a few shells leftover. Use the remaining enchilada sauce, cover all the shells, then sprinkle with shredded Mexican blend cheese. Bake in a 350 degree oven for about 20-25 minutes. Top with some sour cream, or Greek yogurt, green onion and cilantro.